Apparently Derbyshire's most famous dish, the Bakewell Pudding (or Tart) has been falling from favour among health-conscious 21st century Brits. Reports from Kipling Towers suggest that sales of Mr Kipling's (over-sweet and unauthentic) cherry bakewell version have fallen 30-odd per cent in the last few years. So in a selfless bid to help save this local delicacy from extinction, I decided to hot-foot it over to the small market town of Bakewell and put my sweet-tooth to good use for once. 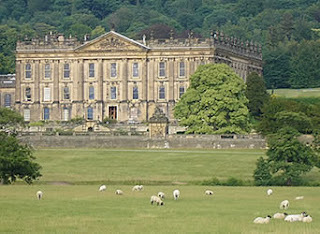 Chatsworth, which lies about three miles to the east of Bakewell, has been the the ancestral home of the Duke of Devonshire and his family, the Cavendishes since 1549. The first house was built by Bess of Hardwick and her husband Sir William Cavendish. The first Duke of Devonshire rebuilt the house at the end of the 17th century which later became the backdrop to the colourful life of Georgiana Cavendish, wife of the 5th Duke, which has been depicted by Keira Knightly in the film The Duchess (due for release in September). I've never quite made it inside the house - exploring the grounds alone could probably take a few days. There are some beautiful walks to explore, winding up the rocky, bracken-clad slopes to the open peaks behind the house (I once spotted then Home Secretary David Blunkett with his black labrador Lucy enjoying a wintry walk here a few years ago). 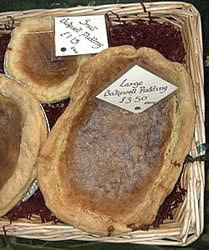 Another highlight is the Chatsworth Farm Shop, situated on the estate in the village of Pilsley on the way to Bakewell. Benefitting from a recent £500,000 expansion, story boards above each section introduce you to the local producers who supply the shop with, among many other things, estate-reared beef, lamb, venison and pheasant, free range eggs, poultry and ice-cream and a huge variety of locally grown fruit and veg. Having got completely sidetracked by just a tiny fraction of what Chatsworth has to offer, I finally arrived in Bakewell, just as the Bakewell Tart Shop was closing and the tourist coaches were departing. A peep through the shop window though and I reckon the legacy of this famous local delicacy is in safe hands with the people of Bakewell (oh, and Jamie Oliver who apparently did a great version in his book Jamie's Dinners).